WARNING: Do not continue reading unless you want to be spoiled MAJORLY on the plot in Real Steel, and I don’t mean the mild spoilers I had in my review for Warrior either. In fact, this post is rather long, and that’s no exaggeration. So continue at your own risk. For those not interested in the spoiler and want just my overall review, please scroll all the way to the bottom of this entry to where I have posted up my personal rating and final opinion on the movie. You know you’re in a good movie when the audience of the theater you’re in start clapping and cheering with great enthusiasm in various places of the story. Great movies, I find, don’t just have a good story, but they also are great at telling it so that emotions are drawn out and there’s that moment of not being able help but feel for a moment that you’re a part of the fantasy world that you are watching. In fact, I even think that in some cases you can find yourself wishing that what you’re watching is actually real, and even find yourself hoping that the movie will keep running (just a few minutes longer, please! ) just so you can enjoy the fictional world for just a little longer. I think a lot of people felt that way about James Cameron’s Avatar. If you don’t believe me, here’s some articles you can look at about that: #1 | #2 | #3 | #4 . Now while I don’t think there was anything that particularly gripped me about the world in Real Steel (because aside from the robot fighting the world itself looked pretty much ordinary), I think I was more captivated by the competition itself and the characters. Aside from Hugh Jackman, I don’t think I’ve ever really heard of Dakota Goyo and Evangeline Lilly, the two actors that played other important roles in the film, but by the film’s end I found myself thinking that their roles were very well casted. In fact, I was particularly impressed with Dakota Goyo’s performance; he played a very precocious 11-year-old child, and the way he acted his role as a very mature 11-year-old who is definitely ahead of his years was quite convincing. I suppose I might be getting a bit ahead of myself though, so let’s start from the beginning. The story opens up with Hugh Jackman’s character, Charlie Kenton, just before his first match of the movie, which takes place at what looks like a rodeo arena. We learn that Charlie is totally drowning in a sea of debt, mostly because the angry phone call that Charlie wakes up to is from someone to whom he owes money, not to mention the fact that Charlie makes his creditor even more angry by confusing him with another one of his creditors and then ends the phone conversation by acting like he’s losing reception on his cell. We also learn pretty quickly that Charlie Kenton is nothing short of an anti-hero; he doesn’t seem to have any real morals and even tries charging some kids $5.00 just to take a picture with his robot. By the way, in case you were wondering, yes, the screenshot on the left is from the movie; however, it is not from the scene that I am talking about. The one in the screencap to the left happens a little later in the movie. Anyway, Charlie Kenton is at this rodeo, where his robot is about to fight a raging bull. Charlie Kenton’s character development throughout the movie is absolutely predictable; at the beginning of the movie you see him as an extremely cocky, overconfident character who definitely acts before he thinks, and oftentimes gets himself into bad situations, like the one he gets into with the host of his rodeo arena fight, Kevin Durand’s character, Ricky, who is nothing short of a you-know-what. (If you’re curious about what “situation” I’m talking about, basically Charlie does a lot of trash talk and bets that his robot will beat Ricky’s bull hands-down for about 20 grand, and you’ll know right away from looking at Ricky and the way that he agrees so quickly that you can already see where this is going–this is definitely not going to be a fair fight.) And then of course by the end of the movie, he’s developed into a much better person than he was at the start of the film, though thankfully it wasn’t all entirely a cliché because even at the end of the movie he still maintains his humanity. What I mean is that he didn’t become this flawless and unrealistically awesome character at the end of the movie; he’s just not as rash or brazen. Before I go on, there’s something both interesting and archaic about these robots used to fight in the various matches of the film. At some point in the film, it is explained that robots were created for boxing in the first place to replace human boxers, because people wanted to be able to see a boxing match that could not only last longer, but provide the audience with the satisfaction that comes from watching one thing beat another down to a crushed mess without any loss of actual human life. These robots, for the most part, are controlled either by voice or by using a controller; it is a concept very similar to most present-day video games, and I believe most closely to the Xbox experience. Those who really enjoy video games (like myself) might find this movie particularly engaging, because it really taps into the inner fantasies of a gamer, especially when you get to the part of the movie with the robots being maneuvered with fancy controls. Transformers fans might also delight in the character designs of some of the robots featured in the film. There are some other minor things that happen that produce a few chuckles, but I’ll leave all those details for you all should you choose to watch it; I’m just covering the parts that I thought were major in the story and stood out most in my mind. Right after the rodeo, Charlie takes what parts he can salvage from the fight and makes a run for it. Remember, Charlie is broke and his loss in the dirty fight means he now owes Ricky $20 grand, and Ricky has made very clear that he is going to chase Charlie high and low to get that money should he choose to run after the match. We then see Charlie making a mad dash for his truck/RVish workstation so that he can hit the road as quickly as possible. He starts packing rather frantically when he notices two men (whom he mistakes for being Ricky’s henchmen coming to collect) approach him. He ends up getting caught by them and finds out that they are actually not associated with Ricky, but rather are investigators who were looking for him because his (ex-wife? Girlfriend? I can’t seem to remember, sorry! I think it’s his ex-wife though.) has passed away and left behind their only son, Max Kenton. This all seems to sink in very slowly for Charlie and before we see him go off to court to sign off complete custody rights to his now deceased ex-wife’s biological sister and her (quite wealthy) husband, he goes to a run-down gym that was previously owned by his late boxing trainer and inherited by what seems to be his current girlfriend. Now there’s definitely a bit of tension in their relationship because, surprise-surprise, Charlie Kenton doesn’t only owe a bunch of angry creditors, he owes a great deal of money to his girlfriend Bailey Tallet as well. Anyway, before Charlie goes off to court, Bailey makes it clear to him that if Charlie keeps going down his current destructive path, she will most likely end up losing her father’s gym and she absolutely isn’t going to stand for that, which is completely understandable. Charlie seems to be conflicted in how he should respond to Bailey’s outbursts and seems torn between promising that he won’t fight with robots anymore and start living a more “normal life,” or asking her to take one more chance on him and finding him another robot. If I recall correctly he kind of settles on doing both–he asks her to help him with one more robot fight and swears that if this next fight fails, he’ll hang his passion for robot fighting up for good and be a good boy. (Hah, like that’ll happen, right?) Bailey reluctantly allows herself to be won over (and it is implied “once again”) by Charlie’s charm and agrees to help him. In the meantime, Charlie heads off to court to settle his other problem, which is the son whom he hasn’t seen since he was born. If you didn’t believe me when I said that Charlie was a jerk before, you’ll probably agree with me after I tell you that his character didn’t even bother to take so much as a minute with the boy and just took off to pursue his robot fighting dreams after completely waiving all custody rights to his ex-wife. Just before we see Charlie Kenton arrive at court, we see his ex-wife’s sister arguing with the judge, asking him to just allow her to receive full custody rights over Max Kenton, which the judge denies because Charlie’s ex-wife (conveniently) didn’t have a will made before she died, which meant that custody automatically goes to next-of-kin, Charlie. As if on cue, Charlie walks in on the custody hearing that very minute, and while he was fully ready to waive over custody rights to his ex-sister-in-law, he notices the giant rock on her ring finger and honestly I couldn’t help but laugh at seeing how fast the wheels in Charlie’s mind seemed to turn as he obviously began to make some very quick calculations and make a very mischievous plan to make some money. That particular long story short, basically Charlie does a bit of haggling (I kid you not) regarding his son and basically gets his ex-sister-in-law’s obnoxiously rich husband to agree to giving Charlie $100,000 and receives half of it up front. The rich husband refuses to give Charlie the other half until he receives Max back in New York, after he returns from his trip with his wife in France at the end of summer. Fast-forward a bit. Meet Max Kenton. I think this kid is a very promising young actor, much like Haley Joel Osment and Dakota Fanning were. He convincingly plays the role of a precocious child that is every bit like his father, from his know-it-all attitude to his undeniable passion for robot fighting. Not to mention the way he talks clearly aggravates his estranged father, because even he sees that the kid is just a younger, snarkier version of himself. After quickly figuring out the deal that was made between Charlie and his rich uncle, he doesn’t hesitate in expressing his immediate hatred for the man that abandoned him without so much as a second thought. At the time of their first meeting, Charlie seems to see his son as nothing more than a temporary nuisance that will only be around for the summer, and he leaves his son to be angry alone outside the gym as he goes to check on his latest purchase that he was able to make with Max’s uncle’s money. His son enters the gym in time to see Charlie unveil his latest bot purchase, and an imported one at that. Its name is Noisy Boy. And while you might cringe at the name the robot is given, the actual design of the bot doesn’t look half bad. We learn that its a Japanese import and that it’s been modified by several other owners in the meantime. It was also once a robot that fought in the “big leagues,” so to speak. 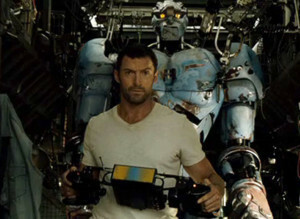 It comes with several upgrades, such as voice commands (which were unavailable in the robot Charlie used at the beginning of the movie), the ability to be controlled in different languages (such as Japanese), and is pre-installed with several (and supposedly impressive) fighting technique combinations that have rather corny technique names. (Think like Dragonball Z and Goku’s favorite “kamehameha!” Haha.) All of which Charlie’s rather clever son does not hesitate to point out to him. Now feel free to disagree, but I thought that Noisy Boy actually looked kind of cool. It’s just too bad it gets absolutely demolished in its first and only match. And I’m not joking you, this bot gets completely totaled because once again, Charlie becomes a little too overconfident and bites off more than he can chew. Charlie and his son then get in an argument about Charlie’s immature decision-making habits, and they head back to the gym where Charlie gets an earful from Bailey who is understandably upset at the fact that he has trashed yet another robot. And this time, it seems, poor Bailey has just about had enough with Charlie and his shortcomings. In fact, she is so fed up that she practically tells Charlie to just get out of her sight, and though people in the audience can probably tell that this is more her taking her years and years of frustration out onto him than anything else, Charlie seems to take the words to heart (or perhaps he thinks it is for the best, so as not to hurt her any further) and decides to hit the road with his son. By the way, unrelated, but the very first screencap I included where Hugh Jackman is on that headset is from the Noisy Boy fight. Another brief side note, I’ve got to say that I had to give Evangeline Lilly’s character some points here for not being a stereotypical “movie love interest” in that she expresses remorse for her earlier comments rather quickly and doesn’t stop supporting Charlie, even if there is no guarantee that he will succeed or become famous. It might be my bias, but I feel like a lot of times boyfriend or girlfriend characters in movies seem to ditch the main character until it seems like he or she is back on his or her feet again, and then suddenly they are back and supporting them 100%. Talk about thanks but no thanks. Anyway, Charlie takes his son to a junk yard late at night and it starts to rain. It’s obvious even before the minute Charlie clips the bolt keeping the junk yard’s gate shut, that what they’re doing is clearly not legal. They dodge a few search lights and start digging for parts; Charlie explains to Max about the general logistics of robot fighting and boxing in general. In the midst of his explanations, Charlie’s unabashed passion towards boxing and fighting with robots shines through. His son then asks him if he misses actual boxing, which definitely hits a nerve. While he warns his son against bringing the topic up again in the future, he also tellls Max to stop walking, because the child almost walks backwards off a cliff. Doesn’t matter though, because a few short seconds later the ground beneath his son gives way and suddenly Max is rapidly sliding down the steep cliff, potentially to his death, and Charlie is meanwhile frantically climbing down a rather lengthy ladder that will lead him down to where Max eventually stops; the back of his jacket getting caught on an outstretched robot arm saves him from plummeting any further. Charlie finally reaches Max and is able to pull his son up. The two of them are caught in a brief, touching father-son bonding moment which quickly fades when Max finds out that the robot arm that saved him is actually attached to a whole entire robot. Max insists on digging the bot out, and Charlie refuses to help and tells Max that if he wants the robot that badly, he’ll have to do it himself. Which he does. Now I couldn’t help but wonder how the kid managed to do this without getting caught, because the boy didn’t drag in the robot until daylight; I mean, if it was “that easy,” then why bother breaking into the junk yard in the first place? Just saying. So now meet Atom. (Max calls him this after he cleans off the robot and notices that the word “atom” is imprinted in Atom’s metal chest plate.) This is the robot that Max declares saved his life, and if you look at it from a more present-day angle, it’s almost like a child bringing home a stray to his or her parents and begging them if they can keep it. Of course, being a lover of robots himself, Charlie doesn’t say no, he just grumbles at how useless this robot is. And by useless I mean it’s a “Generation 2″ which, according to Bailey, means that it’s just a sparring bot–meant to take a lot of hits but not really built to deal any real harm. I could be stretching this idea a little bit, but I couldn’t help but feel that Atom was in a way a representation of Charlie himself. Both are underdogs, and nobody really has any high expectations for either, but both later end up going up against the odds and succeeding. Anyway, Bailey takes a look at Atom and explains to both Charlie and Max that Atom has a rare feature called “shadow-mode,” which basically means that Atom can mimic whatever it sees. We see Max play around with this later when he secretly unhooks Atom in the middle of the night from his charger and goes out for a “jog” with the robot. There are a couple of amusing sequences and then there is a briefly touching moment where Max feels that Atom can somehow understand him, and that scene brought back some feelings of nostalgia about how I felt toward my own toys when I was a kid; I’m sure there are other people out there who can at least somewhat relate to this as well. I think that is one strength that this movie has in the kind of emotions it is able to bring out–it’s not the wow or shock factor it is able to elicit, but rather the memories from childhood or feelings of accomplishment that I’m sure many of us have experienced at one point in time. Sometime later, Max demands that Atom be entered into a robot fight. Charlie tries to convince him otherwise, but Max remains stubborn. Later, while Charlie is off trying to negotiate with some contacts for a loan so that he can get a better robot, Max asks Bailey some questions, like how long she’s known Charlie, and a little bit about what his father was like when he was a boxer. Bailey tells him that his father used to be a decent boxer who once fought the #2 contender in the world and managed to stay in against him for 12 rounds before finally being knocked out cold, a fact that Charlie still holds some bitterness against to this day. To him, it doesn’t matter that Bailey thinks it is amazing he was able to stay in the ring with one of the most formidable boxers in the world, or the fact that has grown to look at him with some admiration; he just can’t get over the fact that he never beat the #2 contender in the world and became a notable boxer himself. Having no luck in finding someone to give him a loan, circumstances eventually lead Charlie to finally give in to his son and allow for Max to enter his robot into a bottom-of-the-barrel fight at a place called “The Zoo,” which apparently is where all the reject robots go to fight. To be honest, I think part of the reason he allows his son to enter the tournament is because he’s giving in to Max like any normal father would to his child who just wants to do something so badly, even though the child knows themselves that they might not succeed. By the way, I watched this film yesterday instead of the day it came out, which was October 7th, mostly because I was too busy with things in my every day life to have gone and seen it on Friday. However, despite the fact that I watched it not too long ago, my memory fails me and so I will have to tell you one thing a bit out of order. At some point, Max goes to a dome, I think it may be when Charlie is trying to get a loan from one of his contacts, and he is able to see Zeus for the first time. Now who is Zeus, you might be asking. Zeus is the #1 bot in the world. No one has beaten him, and he is a rather formidable opponent. He does a lot of one-hit K.O.’s, much like Tom Hardy’s character in Warrior. Anyway, as you might imagine, Charlie and Max’s ultimate goal eventually becomes to defeat this rather indestructible-looking machine. Before they get there though, after the fight at “The Zoo,” there’s a scene where Max spends all night performing upgrades on Atom in a dark workstation with glowing computer screens, drinking a bunch of soda and wearing a wife-beater and I couldn’t help but chuckle because he really looked like a younger version of a man in probably his 40s or 50s, working on some mechanics and chugging some beer. A few minutes later, there’s an even cuter scene where Max takes a break from trying to train the robot and plays around with Atom’s shadow-mode feature and dances to some music, with Atom mimicking his movements. Charlie walks in on this moment and embarrasses Max at first, but eventually tells his son that this is actually a good thing because if Max dances before his fights, he can bring his robot some “flair” for the audience where they lack in looks and customizations. At first, Max rebels against the idea of dancing before each battle, but then he turns it around on Charlie and makes a condition that he will only do that before every fight so long as Charlie will teach Atom his boxing moves, since one of the new upgrades Max has made on Atom is to make the robot’s shadow-mode more adaptive; meaning that Atom is now programmed to remember the moves it learns, and not just mimic them. After thinking about it for a moment, Charlie reluctantly agrees. Anyway, they finally reach the official dome and are immediately bombarded by team Zeus right before Atom’s match against Twin Cities. (And yes, in my opinion, that robot looks as sweet as it sounds. I couldn’t find a better screenshot, but the one to the right features Twin Cities. It’s the third bot from the left; the red one.) They are summoned to “The Zeus Suite,” and are offered $200,000 by the daugther of Zeus’ owner, Farra Lemkova, for ownership over Atom, an offer that remains good only up until Atom’s fight with Twin Cities begins. Charlie is ready to sell the robot, but is unable to because Max refuses to let go of Atom, and after a bit of arguing between them, Charlie agrees not to allow Atom to be sold off to team Zeus. They then enter the battle against Twin Cities and unexpectedly win when Charlie notices last minute that the opposing robot has an Achilles’ heel which he doesn’t hesitate in exploiting, earning them the win. Mostly pumped on adrenaline, Max pushes the announcer declaring Atom’s victory out of the way and steals the mic to rile up the audience and team Zeus by publicly throwing down a verbal gauntlet and demanding that Atom be given the opportunity to have a match against the almighty Zeus. This not only succeeds in exciting the audience, but it also deeply offends Farra Lemkova and another character, Tak Mashido, who is actually the genius behind Zeus’ creation. Again, my memory is a little hazy regarding the sequence of events after the Twin Cities match, but I believe that it is right after that our good ol’ pal from the beginning, sleazy-Ricky comes back out of the woodwork and does a good number on Charlie and his son, and also takes all the money that they have on them. This scene was probably the only one I found a little awkward to watch, but there is a heartfelt moment where Charlie’s son does what he can to make his father feel comfortable while passed out on the ground. Sometime after the scuffle with Ranger Rick (haha, sorry, bad pun), there is a scene where Charlie is staring on at Max pensively, and it’s no surprise when later you see that Charlie is “returning” Max early to his aunt and uncle; an idea that neither Max nor his uncle seem too particularly fond of. At this point, I think it’s safe to say that Max loves his dad enough at this point that he doesn’t care whether or not his own life is in danger, but the feeling is obviously mutual because Charlie only seems to be letting his son go to keep him safe, and not because he wants to. His son then angrily tells him that he wishes Charlie would just fight for him for once, a message that seems to stay with Charlie even after he’s let his son go. Eventually he turns to Bailey for some comfort and she tells him that he should know what he has to do and reminds him that the way Max looks at Charlie is the same way she used to look at her own father, and that she would give anything to have her own father back again. This seems to be enough to inspire Charlie to speed over to Max’s aunt’s house and not only “fight” for his son, but also to apologize for not being the best father he could have been. He then asks his ex-sister-in-law for permission to do one last thing with his son, which is to participate in the Zeus fight, to which the aunt agrees. Father-and-son team back together again, the two go and prepare to face-off against the robot Zeus, who, as I’ve mentioned before, is one giant and nasty hunk of metal. As I’m sure you can see from the picture I’ve included to your left, this is not a robot that can be defeated easily, or has many weaknesses. Even I had my doubts at Atom’s chances of winning when I first saw the robot on screen; it looks considerably stronger than it does in this picture that I found on the Internet. During the match, Atom barely lasts for four rounds when Zeus suddenly and unexpectedly destroys Atom’s voice-command system, pretty much making it impossible for Charlie and Max to communicate with the sparring bot. And the timing couldn’t be worse, because it has just been discovered that Zeus’ main weakness is the fact that his battery has almost completely run out of juice, and if Atom could just hang in for a little while longer, the bot would most likely win the match on stamina alone. (Remember, sparring bots are built to take a lot more hits than “regular” bots.) Things seem to have taken a turn for the worse when Max suddenly remembers Atom’s shadow-mode. He then manages to encourage his father into shadow-boxing the rest of the match. I think it is these last few scenes where we watch Charlie really break out of his bad-luck cycle and really glow that were the most significant part of the film for me. You couldn’t help but just cheer for Charlie, and also feel touched at watching the expression on Bailey’s face, and especially Max. I don’t think I could properly describe the emotion that Dakota Goyo used to portray how his character felt toward’s Hugh Jackman’s character at that very moment, but it was definitely a mixture of pride, admiration, and a sense of relief coming from a son who is absolutely glowing as he watches his father just so happy and almost revitalized as he remembers how it feels again to be boxing. Eventually, the story seems to become less about Atom winning and more about the healing that Charlie experiences as he boxes through Atom. In the end, it seems obvious that Atom has won the fourth round, but the Farra from team Zeus rigs the match so that they are declared the winner, though this decision does not seem readily accepted by the audience because there is a fair amount of booing coming from the stands when the announcement is made. Anyway, once the match ends, Max runs up to Charlie and finally calls him dad while flinging himself on his father. A flood of people flock from the stadiums down to the ring, cheering their support for team Atom. In the last few minutes of the movie, Charlie syncs with Atom and he lifts his son up on his shoulder with Atom mimicking the motion. The movie fades out with a soft blue glow. There is one part of the final match that I did not spoil, and I leave that part omitted because I think it is a part of the movie that is better off seen firsthand and not something that I can effectively communicate through the use of words. Although I have taken great lengths to completely spoil the contents of this film, my hope is that those that are reading are film buffs like myself that only check spoilers to see if dropping the money is worth it, and if they find that after reading a spoiler or two they are still intrigued, that they’d go and watch it even if they already know how everything is going to happen. Phew! Still with me? Hope so–or perhaps you just skipped down here from the beginning because you were only interested in what I rated this movie. The site Rotten Tomatoes rated this movie as rotten at 59%, but personally, I beg to differ. Sure on a classical scale, this movie wouldn’t rate very high, but I think as far as entertainment value and the movie’s ability to draw out a positive reaction from the audience while watching the movie, Real Steel succeeded. I don’t always agree with Rotten Tomatoes anyway, there have been plenty of times where they rated a movie high and I’ve disagreed, and they’ve rated movies I’ve rather enjoyed quite low. A lot of the time our opinions do seem to agree, but this movie is one of those times that we don’t. Also, just so you all know, while I am a Hugh Jackman fan, I’m not a diehard one (yes, I know that’s probably considered a crime to some), but the only movie I’ve ever really liked him in was X-Men: First Class, and he only had one line, but somehow, that did it for me. Until then, he was just an actor with a lot of hype. One thing I appreciated about his role in this movie was that it showed me Jackman was able to transition well out of a more fictitious character like Wolverine and become more human-like as Charlie in Real Steel. I feel like a lot of times once actors get caught up in that one “niche” persona, they seem to carry it with them wherever they go, like Johnny Depp to me seems forever stuck in his Pirates role and Mark Strong seems best fit for gangster or evil overlord roles. Don’t get me wrong, I like those two actors, I just don’t think they’re as versatile as actors like Joseph Gordon-Levitt or Ryan Gosling (who, if you’ll agree, seems to be in just about every other film that’s coming out these days). But I digress. On to the rating. Just as before, I will be giving my final break down of how I would rate this movie on a 1-5 star scale in the following areas; originality, picture (quality, utilization of camera, aesthetics of sets, etc. ), story (plot), casting, and re-watchability factor. There were plenty of things to like about this movie. I didn’t even see it in IMAX and I felt that the picture was of decent quality. However, I do promise to be objective in my ratings and I openly admit that this film is not for everyone. If you’re not a sucker for anything sci-fi, mildly futuristic, and with a cheesy-at-times storyline, then this movie is probably not for you. If you are all about watching a movie that has some mecha elements to it like Voltron or Transformers, and you love your typical underdog success story, then this would definitely be your cup of tea. If you’re asking for my personal opinion, I think this is a movie definitely worth watching, and even re-watching. Now as far as how many times, probably not nearly as much as when I repeatedly saw Inception, X-Men: First Class, and James Cameron’s Avatar in theaters, but I definitely wouldn’t be against watching it once or twice more with a different group of friends each time. Just a brief aside about me–I always watch movies the first time around on the date of their release by myself. If it’s good enough, I’ll go again when my other friends go, but I’m such a movie buff that I have to go by myself the first time, just so I am completely free of distractions and am able to completely immerse myself in the story and enjoy everything that it has to offer. Basically get as close to my money’s worth that I can of my movie ticket. Also, I know it’s been a while since my last movie review, and believe me, I want to be more consistent, but reviews as detailed as this one take a significant amount of time–this particular one has taken me 6 hours to write, and I haven’t even gotten around to the other movies I’ve seen such as Moneyball, 50/50, Drive, Ides of March and even slightly older ones such as Midnight in Paris and One Day. I think that despite what critics might say, I would give Real Steel a chance. Believe it or not, although I may have spoiled a great majority of the film, I did not spoil every single little detail, and I also do not that I gave the emotion of the film enough justice with my words, which is unfortunate. Not to mention Dakota Goyo’s performance is also a must-see. While I’m not going to lie to you and say that the movie is absolutely perfect beyond all measure, I will say that this is a movie where I’m sure you won’t be able to help but walk out of the theater with at least a small smile on your face. And maybe, just maybe, it’ll wake up a small piece of your inner child. The correct spelling of Dakota’s surname is “Goyo”. Thanks for pointing that out. IMDB must have updated that after the fact. I copy-paste cast lists from that website for every entry.